Valve is touting virtual reality with a glimpse of what DOTA 2 players can expect. The potential for virtual reality is intriguing, especially the immersiveness of playing in the game world. But what if you just want to watch? Valve apparently will have that covered in an upcoming VR spectator mode for DOTA 2. In conjunction with today's launch of the HTC Vive, Valve has released a video (via Eurogamer) showing a theater mode for the popular MOBA that will allow players to watch the on screen action while surrounded by the heroes in play and what appears to be a real-time map of the battle. It appears that you can point to a hearo to look at gear and builds, and also jump to them in action in the game. Focusing on the map will also offer details of objectives and how the teams are doing in accomplishing team goals. Nothing was said about the mode other than the visual tease, so a release date is pure speculation at this point. But man, the future of VR sure looks like something I want to be a part of. What the heck Keef is back?! I been mega busy with my game dev, when did you and David get signed on to Shack!? Anyways welcome back man pretty freaking happy for you as well \m/ :) cool! Man Shack is becoming like the The Expendables but in a awesome way with all the all-stars joining the team. RTZ isn't on EG anymore. The video is dated. 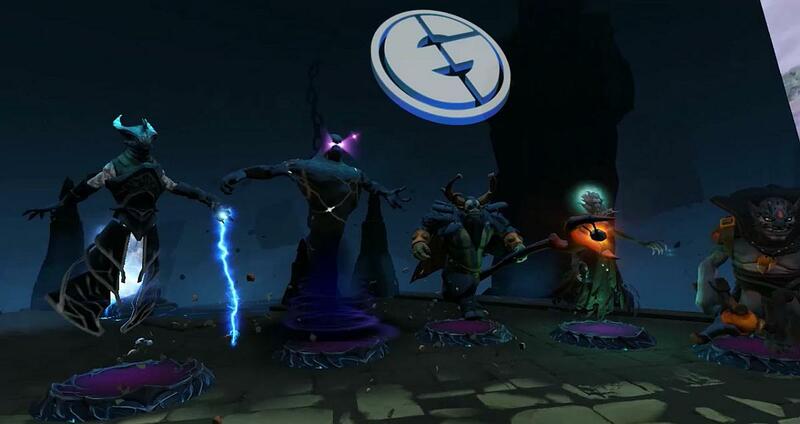 It's from the series that broke EG haha. And it's not "dated', it's the last LAN grand finals. I was kinda hoping more for the entire level with us just hovering about the field like a bird looking down at the teams fight. Cool but wtf it was like 2 seconds at the end?